The default language of ProProfs is English. However, you can configure a site to display in other languages. You can create sites in several different languages. You can also link sites together by language, which means your end users can choose from the languages of the sites you've created. The "language" of a site refers to the site's interface text, messaging, alerts, and page elements as they appear in ProProfs. The language of the content you enter into ProProfs is up to you—referred to as "user-defined content." For example, if you set the language for a site to "Spanish," then you will need to enter in Spanish content when creating pages so that the content matches the ProProfs text and interface. ProProfs fully supports UTF-8 (Unicode), so you can create user-defined content in any language. ProProfs does not automatically translate content for a site. A site for each language must be created and managed independently. For example, if you have a product called ABC Widget and need documentation in English and Spanish, you would need to create two sites in ProProfs (one in English and one in Spanish). This because content, settings, branding, and other features for each language are stored and managed separately for each site. You can link the sites together though, so your end users can easily change languages. "Translate" refers to the process of changing documentation from one language to another (for example, changing English to Spanish). A native speaker of the language usually carries out the process. Translating content into multiple languages can be complicated and requires special software and protocols. As a result, ProProfs does not provide tools or features to translate text from one language to another. Let the translator work inside ProProfs. Provide your translator contributor role. This way, all changes aren't published directly on site. Once the translator is done with the pages, an admin or an editor can bulk publish the pages by going to View All Pages. 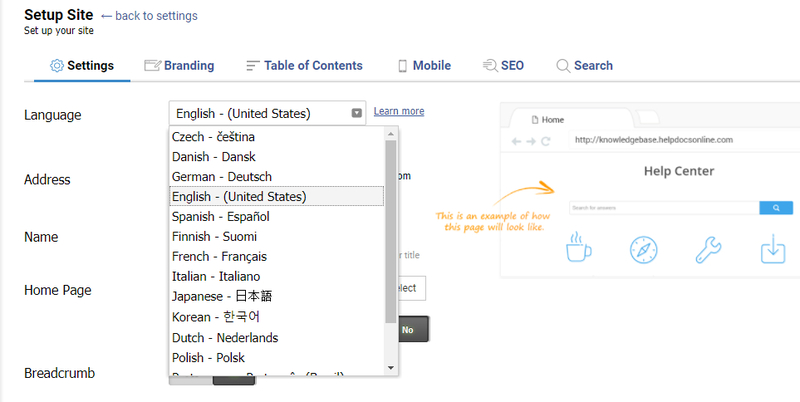 When adding or editing a site, you can select the site's language. Selecting a site's language will change the site's interface text to the selected language. When adding or editing a site, you can link the site to another site. This allows you to link different language sites together so that end users can switch languages. The site is another language of an existing site - The first step is to select Site is another language of an existing site. Selecting this will open up a section below it to select the linked site. Primary site - Select the site you are linking. For example, if you are adding a Spanish option, you could select the English site to link it to. Change Languages - If you select Link sites together with language drop down, a language selection drop-down menu will appear in the toolbar that will allow both logged-in and logged-out users to switch languages. URL of site - By default, each site has its own URL (such as site.helpdocsonline.com or abc.helpdocsonline.com). However, when you link several sites together, you can use the same base URL for all sites. If a site is set to Site is another language of an existing site, then the site's URL will be the primary site's URL + the language's ISO code. For example, let's say you have an English site for http://site.helpdocsonline.com and you want to create a Spanish option for this site. If you select Site is another language of an existing site, then the URL for the Spanish site will be site.helpdocsonline.com/es/ (where /es/ is the ISO code for Spanish). This allows you to keep all your language options under the same base URL. If you have several different languages, you can specify which language is shown by default when going to the base URL. We refer to this as the "primary language." 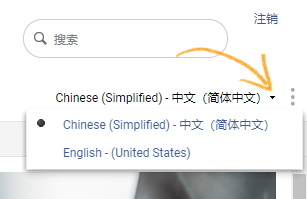 For example, if you have sites in different languages, such as English, Spanish, and Chinese, you will be able to set which language is the "primary site," and that site and language is shown by default. Whenever the user goes to 'site.helpdocsonline.com,' the site will display in English. However, you can change this to show the Spanish site instead. Next, to the language drop-down menu, click on Set primary language. The word Primary indicates which language is the default. To change it, click on Make Primary next to another language. That new language will now become the default and primary language. Also, see Add and Customize a Site.